A tweet from @coneee yesterday about merging two datasets using columns of data that don’t quite match got me wondering about a possible R recipe for handling partial matching. 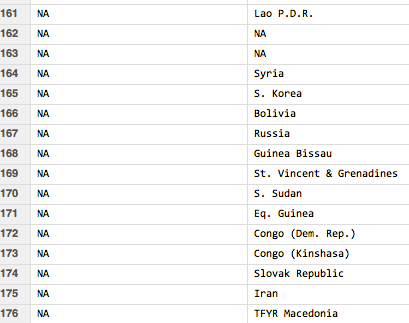 The data in question related to country names in a datafile that needed fusing with country names in a listing of ISO country codes. ##In this case, convert all characters to lower case, sort the words alphabetically, and then concatenate them with no spaces. ##We might also remove stopwords such as 'the' and 'of'.